The Price racing team and rejuvenated Winona Costin make a habit of becoming airborne at Moruya, and again is the form combination to follow at Sunday’s TAB meeting. 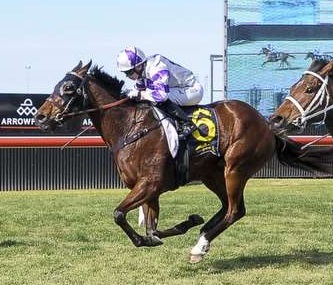 Their pinnacle was combining for a record four winners at the 2015 Moruya Christmas Cup meeting and success has been ongoing, the latest a winning double with stable star Leami Astray and Budderoo Knight at the popular south coast track two weeks ago. Leami Astray, a Moruya track record holder is tremendous value backing up for Winona at Royal Randwick (race 3) on Saturday. While the four winners was a career best for Robert and Luke Price, Winona, the Moruya Racing Ambassador, amazingly boasts better. She emerged as a star in the making when she rode five winners at the Sapphire Coast in early 2014, then numerous city winners led to an offer and an apprenticeship with Gai Waterhouse. After winning the Sydney apprentice’s premiership, long term injuries stalled the “Pocket Rocket”. But now she is back with confidence and in a winning vein. Her rides to win the latest Moruya double were described as “gems” by Robert and they combine with four leading contenders throughout the seven-race TAB meeting where the feature is the $23,000 South Coast Clubs Cup (1435m). Robert is approaching the meeting with confidence but points out his preparations have been disrupted. High Potential & Winona Costin in action at Kembla Grange. Credit: Bradley Photos. They open with debut three-year-old Greyt Weekend in the International Game Technology Maiden (1020m). “I like him, really nice progressive type, trialled pleasingly and drawn to run well,” Robert assessed. High Potential, a five-year-old High Chaparral middle distance mare will be ridden by Costin in the Konami Maiden (1660m). Five-year-old Mohican is ideally placed coming off a Gosford placing and a Nowra win into the Registered Club’s BM 60 (2010m) where he has drawn the outside. Six-year-old mare Hesperos is well placed from an inside draw after being close up at Goulburn and Kembla into the Ainsworth Class 2 (1435m). Moruya at present is rated a good four with fine weather forecast. View the fields and form (including race replays) for Sunday's Moruya meeting here.